Edward Riou FRS (20 November 1762 – 2 April 1801) was an officer of the Royal Navy who served during the French Revolutionary Wars under several of the most distinguished naval officers of his age and won fame and honour for two incidents in particular. Riou entered the navy at 12 years of age, and after a period spent in British and North American waters, served as a midshipman on Captain James Cook's third and final voyage of discovery. Prior to this voyage he had his portrait painted by popular artist Daniel Gardner. Rising through the ranks, he saw service on a number of the navy's stations, but also endured periods of unemployment. He received his first command in 1789, the former frigate HMS Guardian, which was being used to transport stores and convicts to Australia. He had the misfortune to run his ship onto an iceberg, which nearly caused his ship to sink outright. After several attempts to stop the flooding into the damaged hull, most of the crew abandoned ship. Despite fully anticipating his death, Riou refused to leave his ship, and he and a few others were left to attempt the nearly impossible task of navigating the sinking ship several hundred leagues to land. After nine weeks at sea, and with continued labour and endurance, Riou successfully navigated his half-sunk ship back to port, saving the lives of those who had elected to remain with him. His feat earned him promotions and finally commands, but a period of ill-health forced his temporary retirement from active service. Recovering quickly, he was given command of the new 38-gun HMS Amazon, and was assigned in 1801 to Sir Hyde Parker's expedition to the Baltic. Riou worked closely with Vice-Admiral Horatio Nelson during the approach to the Battle of Copenhagen, earning Nelson's trust and admiration. Nelson appointed Riou to command his frigate squadron during the battle, but when the engagement began badly for the British, Riou used his initiative to attack the Danish forts, despite being heavily outgunned. When Parker sent the signal to withdraw, Nelson ignored it and Riou felt he had no choice but to obey his commanding officer, despite his despair at what Nelson would think of retreat. As the Amazon swung away, she exposed her vulnerable stern to the Danish batteries. Riou was encouraging his men to the end when he was cut down by a round shot. Nelson, on learning of Riou's death, called the loss 'irreparable'. A monument was erected to his memory in St Paul's Cathedral, while a poem commemorated the loss of the 'gallant, good Riou'. Riou was born at Mount Ephraim, near Faversham, Kent, on 20 November 1762, the second son of Captain Stephen Riou of the Grenadier Guards, and his wife Dorothy. He embarked on a naval career at the age of 12, joining Sir Thomas Pye's flagship, the 90-gun HMS Barfleur at Portsmouth. His next ship was the 50-gun HMS Romney, flagship of Vice-Admiral John Montagu on the Newfoundland station. Riou was rated midshipman by 1776 and joined Captain Charles Clerke's HMS Discovery for a voyage to the Pacific under Captain James Cook aboard HMS Resolution. The expedition was Cook's third voyage of discovery, and after his death at Hawaii Clerke took command, transferring to Resolution and bringing Midshipman Riou with him. Riou took and passed his lieutenant's examination on 19 October 1780, shortly after the expedition's return to Britain, and received his promotion on 28 October. His first appointment as lieutenant was to the 14-gun brig-sloop HMS Scourge, which was sent to serve in the West Indies. Here Riou appears to have become ill, a common experience for naval officers serving in the tropics, but he survived to return to Britain and was discharged from his ship on 3 February 1782 and went into the Royal Naval Hospital at Haslar. He recovered his health and by April 1783 was back on active service, joining the Portsmouth guardship HMS Ganges. Discharging from the Ganges in June 1784, he went on to half-pay, which lasted for two years until he received another appointment, this time to the 50-gun HMS Salisbury in March 1786. The Salisbury was the flagship of Rear-Admiral John Elliot, who sailed to Newfoundland take up his post as Commodore-Governor there. During this period in his life, Riou was described by a seaman aboard the Ganges as 'a strict disciplinarian with a fanatical regard for cleanliness'. He was also noted to be a religious man, and an affectionate son and brother. A further period on half-pay followed his discharge from the Salisbury in November 1788, but meanwhile he had succeeded in attracting the attention of the Townsend family, and was able to use their patronage to secure an appointment to command HMS Guardian, in April 1789. The Guardian was a former two-decked 44-gun frigate, but had been armed en flûte and loaded with stores to be taken to the British colony at Botany Bay. In addition to these stores, consisting of seeds, plants, farm machinery and livestock with a total value of some £70,000, the Guardian was also to transport a number of convicts and their overseers. Aboard the Guardian was a young midshipman named Thomas Pitt, the son of politician Thomas Pitt, and nephew of Prime Minister William Pitt. With over 300 people aboard his ship, Riou left Spithead on 8 September 1789, and had an uneventful voyage to the Cape of Good Hope where he loaded more livestock and plants. While at the Cape, Riou met Lieutenant William Bligh, who had sailed with Riou on Cook's third voyage during which Bligh had been the sailing master of Resolution. Bligh had arrived at the Cape from Timor, where he had landed after a 3,618 mile voyage in an open boat following a mutiny aboard his ship, HMS Bounty. After completing his re-provisioning, Riou sailed from the Cape in mid-December, and picking up the Westerlies, began the second leg of his voyage to New South Wales. On Christmas Eve, twelve days after his departure from the Cape, a large iceberg was spotted, and Riou decided to use the ice to replenish his stocks of fresh water that were quickly being depleted by the need to supply the plants and animals he was transporting. Riou positioned himself near the iceberg, and despatched boats to collect the ice. By the time the last boats had been recovered, night had fallen and a sudden fogbank descended, hiding the iceberg from view. Riou found himself in a dangerous situation. Somewhere to leeward lay a large mass of ice, concealed in the darkness and fog. He posted lookouts in the bows and rigging, and began to edge slowly forward. After sometime the danger seemed to be past, and the iceberg left behind, when at 9 o'clock a strange pale glow was reported by the lookout in the bows. Riou ordered the helm to turn hard a starboard, turning into the wind as a wall of ice higher than the ship's masts slid by along the side. It briefly appeared that the danger had been avoided, but as she passed by, the Guardian struck an underwater projection with a crash. Caught in a sudden gust of wind, the ship reared up and swung about, driving the stern into the ice, smashing away the rudder, shattering her stern frame and tearing a large gash in the hull. Despite the seriousness of the situation, Riou remained calm, using the sails to pull clear of the ice, and then taking stock of the damage. 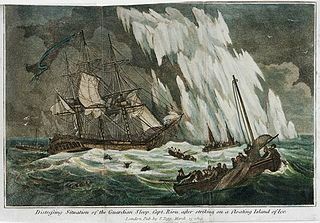 If any part of the officers or crew of the Guardian should ever survive to get home, I have only to say their conduct after the fatal stroke against an island of ice was admirable and wonderful in everything that related to their duties considered either as private men or on his Majesty's Service. As there seems no possibility of my remaining many hours in this world, I beg leave to recommend to the consideration of the Admiralty a sister who if my conduct or service should be found deserving any memory their favour might be shown to her together with a widowed mother. Riou gave the note to Mr Clements, the master of the Guardian, who was given command of the launch. A total of 259 people chose to join the five boats, leaving Riou with sixty-two people; himself, three midshipmen, including Thomas Pitt, the surgeon's mate, the boatswain, carpenter, three superintendents of convicts, a daughter of one of the superintendents, thirty seamen and boys and twenty-one convicts. The Guardian was nearly awash by now with 16 feet of water in the hold, but a bumping noise on the deck attracted attention, and on investigation was found to be a number of casks that had broken free and were floating in the hold, trapped under the lower gundeck. Realising that this was providing extra buoyancy, Riou had the gun deck hatches sealed and caulked, while another sail was sent under the hull to control the flooding. Having now created a substitute hull out of his deck, Riou raised what little sail he could and began the long journey back to land, with the pumps being continuously manned. For nine weeks Riou and his small crew navigated the Guardian, by now little more than a raft, across the 400 leagues to the Cape of Good Hope. The Cape of Good Hope was sighted on 21 February 1790, and whalers were despatched from Table Bay to help the battered ship to safety. Riou ran her aground to prevent her sinking, but a gale struck the coast shortly afterwards, completing the wreck of the Guardian. The voyage was described by J. K. Laughton in the Dictionary of National Biography as 'almost without parallel'. Those who remained with the Guardian were among the few survivors of the accident. Of the boats sent out on 25 December, only the launch with 15 people survived, having been rescued by a French merchant. The launch had witnessed the sinking of the jolly-boat, before losing contact with the two cutters and the long-boat. Riou arranged for the surviving convicts who had helped to save the ship to be pardoned for their good service. Riou returned to Britain and was met with popular acclaim for his feat. Acquitted of any blame for the loss of his ship, he was promoted to master and commander on 21 September 1790, and advanced to post-captain on 4 June 1791. These promotions were for rank only, and he did not receive a command until after the outbreak of the French Revolutionary Wars. Appointed to command the sixth rate HMS Rose in June 1793, he served in the West Indies with Sir John Jervis and was active in the operations against Guadeloupe and Martinique in 1794. He was moved to the 40-gun HMS Beaulieu in November 1794, capturing a number of small French vessels before ill-health forced him to be invalided home. In the meantime, he was appointed to the yacht HMS Princess Augusta, but his health improved and he was able to return to active service in June 1799 with an appointment to command the 38-gun HMS Amazon. He was active against French privateers, before being assigned to Sir Hyde Parker's expedition to the Baltic in 1801 to compel the Danes to abandon the League of Armed Neutrality. After the British force had surveyed the Danish positions around Copenhagen, a council of war was held between Parker, his second in command Vice-Admiral Horatio Nelson, and the other British captains. Riou was among those present. Riou had worked closely with Nelson and Captain Thomas Foley in the lead up to the attack, and Nelson duly appointed him commander of the frigates and smaller vessels, with the instruction to deploy his ships to support the main fleet. As the battle began, several of Nelson's ships ran aground on shoals in the harbour, and a new plan of attack had to be improvised. As Nelson's ships of the line engaged their Danish counterparts, Riou took his frigates in to harass the Tre Kroner forts and blockships. Despite being heavily outmatched and dangerously exposed, they exchanged fire for several hours. The ships suffered heavy casualties; Riou was hit on the head by a splinter. ...was sitting on a gun, was encouraging his men, and had been wounded in the head by a splinter. He had expressed himself grieved at being thus obliged to retreat, and nobly observed, 'What will Nelson think of us?' His clerk was killed by his side; and by another shot, several marines, while hauling on the main-brace, shared the same fate. Riou then exclaimed, 'Come, then, my boys, let us all die together!' The words were scarcely uttered, when the fatal shot severed him in two. Command of the Amazon devolved to her first lieutenant, Lieutenant John Quilliam, who completed the withdrawal. Nelson, who had not known him before this expedition, had conceived a great affection for Riou, and wrote 'In poor dear Riou the country has sustained an irreparable loss.' The naval historian Sir Jahleel Brenton declared that he had all the qualities of a perfect officer. ^ "No. 15354". The London Gazette. 15 April 1801. p. 3. ^ Louise, Anemaat (Summer 2015). "Portrait of a Young Midshipman" (PDF). S L Magazine. Vol. 8 no. 4. p. 23. ^ a b c d Tracy. Who's who in Nelson's Navy. p. 305. ^ a b c Crealock. The Frontier War journal of Major John Crealock, 1878. p. XVI. ^ a b c d John Knox Laughton, "Riou, Edward" . Dictionary of National Biography. London: Smith, Elder & Co. 1885–1900. P. 315. ^ a b c d e f g h i j k l m n o p q r s t u v w Tracy. Who's who in Nelson's Navy. p. 306. ^ a b Coleman. The Royal Navy in Polar Exploration. p. 107. ^ a b c d e f g h i j k Coleman. The Royal Navy in Polar Exploration. p. 109. ^ a b c d e f g h i j k l m n o p q r s t u John Knox Laughton, "Riou, Edward" . Dictionary of National Biography. London: Smith, Elder & Co. 1885–1900. P. 316. ^ a b c Winfield. British Warships of the Age of Sail: 1714–1792. p. 175. ^ a b c d e f g h i j k l Coleman. The Royal Navy in Polar Exploration. p. 110. ^ a b Coleman. The Royal Navy in Polar Exploration. p. 111. ^ a b c d e f Coleman. The Royal Navy in Polar Exploration. p. 112. ^ Winfield. British Warships of the Age of Sail: 1714–1792. p. 231. ^ Winfield. British Warships of the Age of Sail: 1714–1792. p. 205. ^ a b Winfield. British Warships of the Age of Sail: 1793–1817. p. 141. ^ Adkin. The Trafalgar Companion. p. 468. ^ a b Coleman. The Royal Navy in Polar Exploration. p. 113. ^ Palmer. Command at Sea. p. 191. ^ The Visitor's Guide to the Sights of London. p. 64. ^ Cummings. The Companion to St. Paul's Cathedral. p. 11. The Visitor's Guide to the Sights of London: Including the National Exhibitions of Greenwich Hospital,Woolwich Arsenal,etc. London: W. Strange, Paternoster Row. 1844. OCLC 794348341. Coleman, Ernest (2006). The Royal Navy in Polar Exploration: From Frobisher to Ross. Tempus. ISBN 0-7524-3660-0. Crealocke, John (1989). The Frontier War journal of Major John Crealock, 1878: a narrative of the ninth Frontier War by the assistant military secretary to Lieutenant General Thesiger. The Van Riebeeck Society. ISBN 0-620-14455-6. Cummings, E. M. (1840). The Companion to St. Paul's Cathedral: Containing a Description of the Various Objects Worthy Attention, and Its History: to which is Added, a Brief Historical Sketch of the Ancient Church. London: Stewart and Murray. OCLC 794812625. OL 25529733M. John Knox Laughton, "Riou, Edward" . Dictionary of National Biography. London: Smith, Elder & Co. 1885–1900. Palmer, Michael A. (2005). Command at sea: naval command and control since the sixteenth century. Harvard University Press. ISBN 0-674-01681-5. HMS Guardian was a 44-gun Roebuck-class fifth-rate two-decker of the Royal Navy, later converted to carry stores. She was completed too late to take part in the American War of Independence, and instead spent several years laid up in ordinary, before finally entering service as a store and convict transport to Australia, under Lieutenant Edward Riou. Riou sailed the Guardian, loaded with provisions, animals, convicts and their overseers, to the Cape of Good Hope where he took on more supplies. Nearly two weeks after his departure on the second leg of the journey, an iceberg was sighted and Riou sent boats to collect ice to replenish his water supplies. Before he could complete the re-provisioning, a sudden change in the weather obscured the iceberg, and the Guardian collided with it while trying to pull away. She was badly damaged and in immediate danger of sinking. The crew made frantic repair attempts but to no apparent avail. Riou eventually allowed most of the crew to take to the Guardian's boats, but refused to leave his ship. Eventually through continuous work he and the remaining crew were able to navigate the ship, by now reduced to little more than a raft, back to the Cape, a nine-week voyage described as 'almost unparalleled'. Riou ran the Guardian aground to prevent her sinking, but shortly afterwards a hurricane struck the coast, wrecking her. The remains were sold the next year, in 1790. HMS Carcass was an Infernal-class bomb vessel of the Royal Navy, later refitted as a survey vessel. A young Horatio Nelson served aboard her as a midshipman on an expedition to the Arctic in 1773. Sir Thomas Baker KCB, KWN was an officer of the Royal Navy, who saw service during the American War of Independence, and the French Revolutionary and Napoleonic Wars. He had obtained his own command during the French Revolutionary Wars and was to play a part in bringing about three of the battles of the Napoleonic Wars, the Battle of Copenhagen, the Battle of Trafalgar, and the Battle of Cape Ortegal. He only directly participated in the third, but his actions there, and the capture of the French frigate Didon (1805) beforehand brought him honours and rewards. While towing the Didon to a British port, he and another vessel were sighted by the combined Franco-Spanish fleet under Pierre-Charles Villeneuve, and mistaken as scouts for the Channel Fleet. He therefore turned south to Cadiz, leading to the abandonment of the planned invasion of England, and the destruction of the French fleet at Trafalgar by Horatio Nelson some months later. He rose through the ranks after the end of the wars with France, and was commander of the South America Station during Charles Darwin's voyage aboard HMS Beagle. He eventually died with the rank of vice-admiral in 1845 after a long and distinguished career. HMS Amazon was a frigate of the Royal Navy. She served during the French Revolutionary and Napoleonic Wars under several notable naval commanders and played a key role in the Battle of Copenhagen under Captain Edward Riou, when Riou commanded the frigate squadron during the attack. After Riou was killed during the battle, command briefly devolved to First-Lieutenant John Quilliam. Quilliam made a significant impression on Rear-Admiral Horatio Nelson who appointed him to serve on the flagship HMS Victory, and Amazon passed to William Parker, who continued the association with Nelson with service in the Mediterranean and participation in the chase to the West Indies during the Trafalgar Campaign. She went on to join Sir John Borlase Warren’s squadron in the Atlantic and took part in the defeat of Charles-Alexandre Léon Durand Linois's forces at the Action of 13 March 1806. During the battle, she hunted down and captured the 40-gun frigate Belle Poule. Admiral Sir George Elliot was a Royal Navy officer who served during the French Revolutionary and Napoleonic Wars, and the First Opium War. Philemon Pownoll of Sharpham in the parish of Ashprington in Devon, England, was an officer of the Royal Navy who saw service during the War of the Austrian Succession, the Seven Years' War and the American War of Independence, rising to the rank of post-captain. HMS Racehorse was an 18-gun ship-rigged sloop of the Royal Navy, later refitted as a survey vessel. She was originally the 18-gun French privateer Marquis de Vaudreuil, captured from the French in 1757 during the Seven Years' War, and purchased for the British Navy on 28 April 1757. As she was a three-masted vessel, she was described as a 'frigate', but as she mounted just 18 guns, she was actually registered as a sloop. Augustus Brine was an officer of the Royal Navy who served during the American War of Independence and the French Revolutionary and Napoleonic Wars.